The Marine Aquarium Conference of North America (MACNA) is the oldest marine aquarium conference in North America. MACNA is managed by the Marine Aquarium Societies of North America (MASNA), supporting the goals and programs of the MASNA charter. MACNA is a combination of several events. It is an educational symposium where people can attend lectures from industry leaders, conservationists, authors, and scientists. It is also a trade show where hobbyists can buy the hottest new corals and see new cutting edge equipment. Attendees can also give their feedback to manufacturers so they can continue to bring us the innovations we are looking for. And lastly it is a social event. Many speakers, vendors, and hobbyists come to socialize with each other. It gives people an opportunity to put faces with names they might see on a message board or email. The 30 Years of MACNA! Tom McCarthy of the Cleveland Saltwater Enthusiasts’ Association (C-SEA) made a phone call to Scott Dyer of the Marine Aquarium Society of Toronto (MAST). The idea presented was to organize a joint event featuring a prominent speaker to be attended by both societies’ memberships. Scott replied to Tom that he had been thinking along the same lines and it was from this simple start that the idea of a weekend conference was born. MAST agreed to host the first Marine Aquarium Conference of North America (MACNA) and C-SEA agreed to reciprocate the following year. Helmut Debelius (Red Sea Fish and Invertebrates). The Conference was held in the main lecture hall of the Royal Ontario Museum and featured several new products on display for the benefit of attendees and participants. Saturday night featured cocktails and a banquet (establishing the MAC NA tradition of carrying on well into the night hours). The MACNA I Committee, in alphabetical order, consisted of: Ken Burrows, Sheila Byers, Charles Delbeek, Roger Driessen, Scott Dyer, Bob Harris, Russell Jardine, Paula and Goran Jovanevic, Bev and Chris Knight, Ian Shapiro, Ron Tuur, and many more who helped on the day of the Conference. MACNA II was planned and organized by C-SEA’s Dave Egloff, Ron and Iris Garsteck, Tim Hemsoth, Joe Keyon, Dominic Madonia, Tom McCarthy, Kent Seward, and Roger Seward. Frank Murru (Sea World and Maintenance of Public Aquaria). Neville Coleman (Brisbane, Australia) was also the featured speaker at the Saturday night buffet held on the grounds of Sea World. Toronto and Cleveland had made a great contribution to the aquarium hobby by taking on the organization and planning of these first two conferences. Excitement ran high at each event – so high that the idea of an annual conference kept surfacing. If there were to be a third MACNA, who would host it? Fortunately, in attendance at MACNA II, were members of Windows to the Sea Marine Aquarium Society (NJ). They returned from Ohio and presented the idea of hosting a conference to their club (Windows). In October of 1990, Windows agreed to “take the plunge” and commit itself to hosting MACNA Ill.
MACNA III was held on April 20-21, 1991 at the Radisson Hotel, Newark International Airport, New Jersey. Windows organized seven committees: Publicity (Bob Denton), Program (Bob Denton), Fund Raising (Allan Starace), Banquet (May Markoff), Audio-Visual (Jerry Riedler), Journal – i.e. Advertising, Layout and Design (Mehul Sheth), and Finance (Jack Snyder). The Saturday night banquet was a sit-down affair with a fixed menu. Following the banquet, aquarists adjourned to another room where Helmut Debelius delivered a breathtaking slide presentation entitled “Discovering a New Angelfish” . Attendance at the third conference ran well over 300 – MACNA had become a known and awaited event in the aquarium world. Florida had been approached through Beth Hayden to possibly host MACNA IV. Florida Marine Aquarium Society (FMAS) members, like their New Jersey counterparts, were in attendance at MACNA III, and returned home to present the possibility to their Club of hosting a Conference in Miami. MACNA IV was supposed to have been held September 19-20, 1992 at the Sonesta Beach Hotel on Key Biscayne. In August of 1992, Hurricane Andrew devastated south Florida leaving residents without phones, power, water, food, housing and gas. The Sonesta Beach Hotel was unusable. Once phone communications were restored, the FMAS Board was able to meet to decide whether to try and continue with MACNA. It was decided that if an alternate hotel with adequate space and facilities could be found, MACNA IV would take place as scheduled. FMAS was successful in relocating the Conference to Dania, Florida (north of Miami) and a phone committee was set up to call every registrant to confirm the Conference was on and explain the shift in locale. Hotel, banquet and ancillary service negotiations, completed months ago, were speedily renegotiated. A Friday night “get-acquainted” reception and “mini-program” was provided for attendees and speakers. Panel Discussion: The Future of the Marine Aquarium Hobby in North America: Is There One? Charles Delbeek (Stingers, Suckers, Munchers and Maulers: An Introduction to Reef Aquarium Parasites and Pests). Two repeating workshops, offered twice each day, were given by Godfrey Waugh and Jill Hambrook-Broz (The A-B-C’s of Marine Fish Nutrition) and Martin Moe (How to Raise 100 Clownfish and Still Keep a Job and Your Spouse). Approximately 400 attendees came to Dania from the U.S., Puerto Rico, Canada, Europe and throughout the U.S. Co-Chairs for MACNA IV were Beth Hayden and Richie Strassberg. Committee members included: Michele Arena, Cindy Bickford, Danny Garcia, Debbie Garcia, Nancy Lempicki, Bruce Moreland, Michael Robert, Roseanne Strassberg and Tom Cavanaugh. Toronto (MAST) had already indicated its willingness to host MACNA V – for the first time, it was possible to announce at the close of MACNA IV, that not only would a MACNA V take place, but when and where it would be held and what club would host it. On Saturday evening attendees were bussed to the Ontario Palace for a gourmet dinner and spectacular presentation of slides entitled “Wild Aquarium I” presented by Rudi Kuiter in the Cinesphere’s IMAX theater. The two upcoming conferences were already scheduled: MACNA VI would return to Cleveland/C-SEA and MACNA VII would be hosted by the Louisville Marine Aquarium Society (LMAS) in Louisville, Kentucky in 1995. Gerald Heslinga (Micronesian Mariculture Demonstration Center – Mariculture Efforts). A cash bar preceded the Saturday night banquet after which Richard Pyle presented a slide show of rare and exotic deep-dwelling marines. During the course of the Conference, Stuart Keefer gave a brief, unscheduled presentation on his “Eco-Labeling Project”. MACNA VI drew the largest attendance to date with well over 400 aquarists, professional and amateur. With Conference planning well coordinated in advance, Louisville was able to distribute brochures for its upcoming MACNA VII at the Cleveland Conference. Vendor participation increased as well at Louisville. There were over twenty two well known vendors displaying. The Saturday night Banquet was well presented and Dr. Gerald Allen thrilled us with a nine position multimedia production shown on a back projected screen. 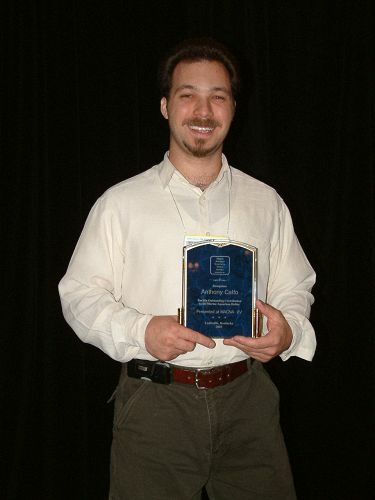 The First MASNA “Outstanding Hobbyist” award was presented to Martin Moe. • Melev’s Reef: What is MACNA? Why should you attend? • MACNA 1998: Aquarium Design’s photos. • MACNA 2007: Melev’s photos. • MACNA 2007: Walt’s MACNA 2007 Banquet Video. • MACNA 2008: Victor90’s ReefCentral photos. • MACNA 2012: Melev’s photos. • MACNA 2014: Matt Rogers’ 3Reef photos.